The infrared (IR) communication technology, which existed long before WiFi and Bluetooth, is still a key component in implementing major components of a typical home automation system. For example, IR technology is still used in cordless headphones, for intrusion detection in home security systems, and in handheld remotes for controlling home entertainment systems (TV, DVD, soundbox, etc), air-conditioning units, and other household appliances. Because IR technology requires a line-of-sight between the transmitter and receiver units, it can only be used for connecting devices in short range, like in a same room. In one of my previous articles, I wrote about a simple IR remote control circuit based on the CD4017 decade counter IC. That was capable to switch on and off any home appliance hooked to it by using any TV/DVD remote. Today, I am going to show how to make an Arduino-based IR receiver for decoding the IR signals coming from a TV/DVD remote. 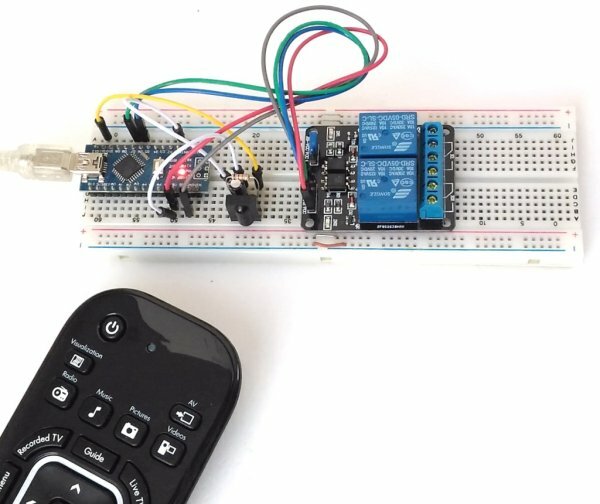 Based on the decoded values corresponding to specific buttons on the remote, we will program the Arduino to control multiple relay switches.